Perhaps one of the most unique Japanese artists out there, Violent Onsen Geisha's sense of humor is far more cynical and sarcastic than that of say, Yamantaka Eye. Otis, like many of Nakahara Masaya's recordings, consists of pop culture nods and strange mash-ups. This is not an album as much as it is a musical collage. To call Nakahara just another noise artist is almost undermining his finely tuned ear for the absurd. One notable song that fairly represents Nakahara's humor is a loop of the main guitar riff from Lenny Kravitz's, "Are You Gonna Go My Way?" combined with his signature frenzied screams and some bells and whistles to boot. Surprisingly, the booklet in this CD states that no samplers, synthesizers or keyboards were used in the making of this recording. I guess there are two versions of this CD out there. I have the one off of the Endorphine Factory label, which I believe is the first pressing, and it only consists of 3 tracks, the last track clocking in at 59+ minutes and combining some 7 odd songs. While this may be a bit tumultuous, I think it only helps emphasize Nakahara's madness. 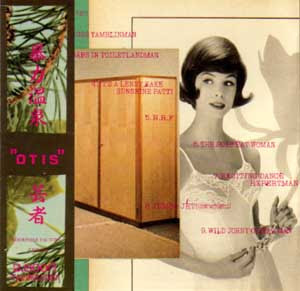 If you think you've heard everything that Japanese noise had to offer already, check out Otis. You will be pleasantly surprised. f'kyea! when did you finally find this?